Sometimes I question why I decide to blog some recipes, while I don't blog others. Sometimes I just automatically know yes this has to be blogged, where other times, it is definitely a no. 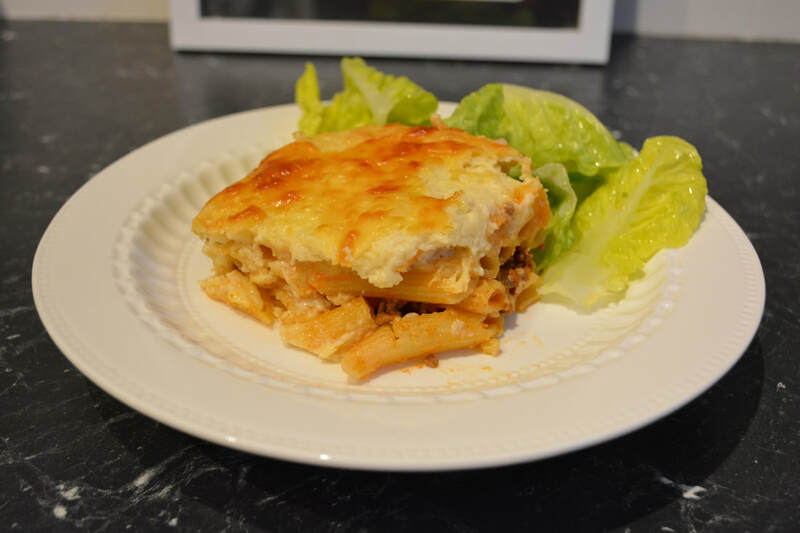 This recipe had me thinking should I or should I not blog it, I already had Pastitsio on my site, so this is similar, but this was different in that it used so little ingredients, yet the taste was amazing. So I decided yes as one, it was delicious, and two even though I had a similar dish up, I had to post this one as it was made with so little ingredients, was a cheap recipe to make and it was worthy of being here, I would definitely want to eat this again. This recipe I found whilst on my Week 4 Eating Around the World adventure that led us to Egypt. So this is Egypt's version of a pasta bake. 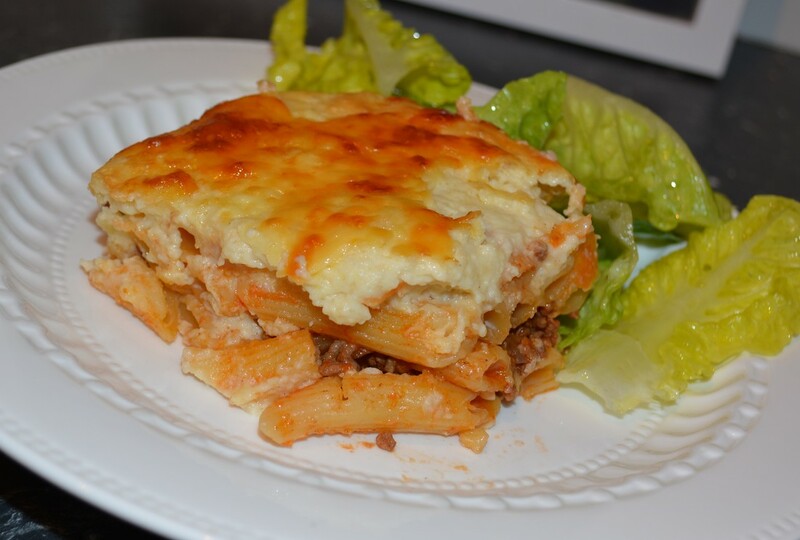 With a bit of mince and a few basic pantry items you can make this, it is tasty, cheap and easy to make. You make a simple sauce with mince and tomato paste basically, cook some pasta, make up some bechamel and that's it, dinner done, and it's great. Now the original recipe did not add cheese on the top, I however did as I just happened to have a cup full of cheese leftover in the fridge, plus I do love cheese. You could also add cheese into the bechamel. You can use any pasta shape you love really, I just love it with penne. For the bechamel you could use half milk and half chicken or vegetable stock. That is up to you. You could also decrease the amount of flour in the bechamel if you want a runnier bechamel. This one is thick, but allows nice slicing and does taste good. Need a cheap mid week meal idea that is easy and tasty, you have to try this. Fill a large saucepan with water, season with some salt, bring to the boil. In a pan over medium heat, add 2 tablespoon of oil, then sauté onion until fragrant, about 2-3 minutes. Add minced meat and brown, breaking it up with a wooden spoon. Add 2 tablespoons of the tomato paste, mixing everything well together. Continue cooking for a couple of minutes more. Season with salt and pepper. Set aside. One your water has come to the boil, cook the pasta according to package directions, make sure it is al dente, as it will continue cooking in the béchamel sauce in the oven. Drain and do not rinse. In a pan over medium heat, melt butter, add flour and whisk, for about 1 minute. Add the milk gradually, one cup at a time whisking vigorously as the sauce thickens. When it is bubbly and thick, turn off the heat, season with salt and pepper and let it cool down. Preheat your oven to 175C/155C fan forced. ​Add the remaining 2 tablespoons of tomato paste to the pasta and about half a cup of the béchamel sauce, season with salt and pepper, mix well. In a 22xm x 33cm baking dish, spread another 1/2 cup of the béchamel sauce evenly on the bottom, just to cover the base. Spread half the pasta, then layer the entire meat mixture over the pasta. Top that with the remaining half of the pasta and level. Crack an egg over the remaining béchamel sauce and whisk well. Pour the béchamel over the pasta and spread evenly. Bake in oven for almost 45 minutes or until it is golden brown. Allow to cool for 10-15 minutes. Slice and serve with a green salad.